I guess you know figured my love for blueberry muffins? I have seen and tried so many flavors at central market. They even have ginger and pear and apricot as well. But somehow, I am always loyal to the berry kind..especially plump blueberries that burst in your mouth. I like my muffins to have blueberries in every bite! Unlike the tiny, dried blueberries you find in the prepackage muffins. These muffins are so simple to make that my daughter whipped them up for her lunch snack. With summer around the corner, you’ll bet I will be using blueberries in many of my desserts. 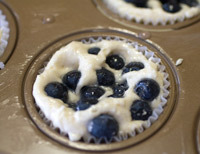 As soon as I filled the muffin liners with the batter, I like to top extra blueberries before baking them. Now that is like a red cherry on top a great dessert. In a second bowl, combine all dry ingredients. (You can use an electric mixer to combine the dry ingredients thoroughly at this point so that you won’t need to overmix once the wet and dry ingredients are combined. Optionally, mash 1/2 cup of the blueberries, and stir in by hand (this will turn batter a light shade of blue and add a touch of blueberry flavor, but this step may be skipped, if you wish). Add the remaining whole berries and stir in gently by hand. Spray a 12 muffin baking pan with Baker’s Joy (or other non-stick spray). Fill greased muffin cups. Sprinkle sugar on top of unbaked muffins (we like to use Turbinado sugar for sprinkling the tops). At our test kitchen, we sometimes sprinkle blueberry muffin tops with cinnamon sugar or ground hazelnuts or spread with lemon or vanilla icing and top with thinly sliced almonds. Tip: If you have trouble with blueberries settling to the bottom try tossing them in flour before adding to the batter. It may just be that your batter is too thin. Another trick is to fill muffin cups 1/4 full with batter which hasn’t had blueberries added to it yet; then stir the blueberries in and continue to fill the muffin cups. This way you won’t start out with blueberries at the bottom! I was watching food network again. It is not good to watch any cooking shows when you are hungry. I am one of those that can eat breakfast food anytime of the day. I just find pancakes, waffles, and biscuits with gravy so comforting. I just like my food dipped in syrup or gravy. So, I saw a diner that made this pancake”souffle”. Yeah, it sounds kinda cool and unique. But, when it has berries too? I was hooked. I literally made an excuse to go to the grocery to pick up some strawberries. This dish is has ripe strawberries, sliced bananas and lightly dusted with powdered sugar. Is that beautiful food poetry or what? Anyhow, the pancake took a little more time since the extra step of cooking from stove top and finishing it off in the oven. These extra steps will result in a fluffy texture of a souffle. This pancake taste more eggish than I would have preferred..but that typical of any souffle. To make this more decadent, I would drizzle chocolate syrup and add a dollop of whipped cream..now that is the red cherry on top of any good pancake! Summary: Soufflé pancakes are light and airy while remaining incredibly decadent. Feel free to smother yours in powdered sugar, chocolate syrup, or your favorite fruit. A pan that can go from stovetop to oven is essential to making this dish correctly – 10-inch cast iron skillets are your best, and cheapest, bet. 1. Preheat the broiler in your oven. Alternately, preheat your oven to 400F. 2. Beat the egg yolks and half & half in a large bowl until well mixed. Slowly whisk in the flour, stirring just until combined, then whisk in the butter, sugar, salt, and vanilla. Set aside. 3. In a separate bowl, beat the egg whites with an electric beater until they form soft peaks. Gently fold the whites into the batter, folding just until the whites disappear. You don’t want to flatten your egg whites, lest you compromise the fluffiness of your lovely soufflé. 4. Lightly grease a 10-inch nonstick ovenproof pan and set it over medium-high heat for one minute. Pour the batter into the hot pan and reduce heat to medium. Cook the pancake for 5 minutes, until the batter begins to firm up a bit. Drop chunks of chopped fruit onto the surface of the pancake. 5. Place the pan 5 inches below the hot broiler, or if you don’t have a broiler, slide the pan into the preheated oven. Bake for 2-3 minutes, or until the pancake is puffed up and center is set but still soft. Watch carefully to make sure the top doesn’t burn! These things tend to head south pretty quickly, so don’t walk away from your oven while the soufflé pancake is baking. 6. Slide the pancake onto a plate using a spatula. Dust with powdered sugar and more fruit, if you like. Eat immediately. It is the start of summer here in Dallas. I just made my weekly visit to local market and came across some fresh blueberries on sale. I have been waiting all winter (short one here) for fresh blueberries. I usually buy extras and freeze them so I have them on hand for breakfast muffins. Last year, my sister in Oregon would go berry picking and she had tons leftover. Frozen blueberries are easier and cleaner to work with in batter such as pancakes, crepes, muffins, and even smoothies. Since they are frozen, they do not get mushy and turn the batter blue (I end up with smurf fingers). I am always drawn to those big muffins at the coffee shop and could not help but wonder how they do it. My favorite part is the muffin top. It is crunchy around the edges. But, most of the store bought are lacking in berry flavor. It has that box mix after taste and way too much additives. I have tried many muffins recipes. But, I think I may have found the taste I was hoping for. Here is my recent baking attemps using the recipe from Cooks Illustrated. Their secret is making a jam and swirling in the batter before baking. It does give an extra burst of blueberries. They also made a lemon zest and sugar topping that I did not really care for. Next time, I will use a standard walnut struesel topping instead for a crunch texture.